Freestyle scooters with inflatable wheels, suitable also for terrain, are a new item in our offer. The handlebars can be turned in 360° and the footboard has a special anti-slip surface. 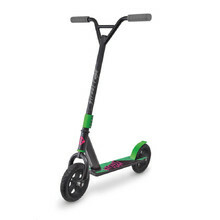 Even better manoeuvrability of the dirt scooter is ensured by a foot brake and anti-shock grips.